Description: This photograph shows the SR-71 with the Linear Aerospike SR-71 Experiment on the rear fuselage as seen from above. The photo was taken on the first flight of the aircraft with the experiment aboard, which took place on 31 October 1997. Description: The LASRE experiment was designed to provide in-flight data to help Lockheed Martin evaluate the aerodynamic characteristics and the handling of the SR-71 linear aerospike experiment configuration. The goal of the project was to provide in-flight data to help Lockheed Martin validate the computational predictive tools it was using to determine the aerodynamic performance of a future reusable launch vehicle. 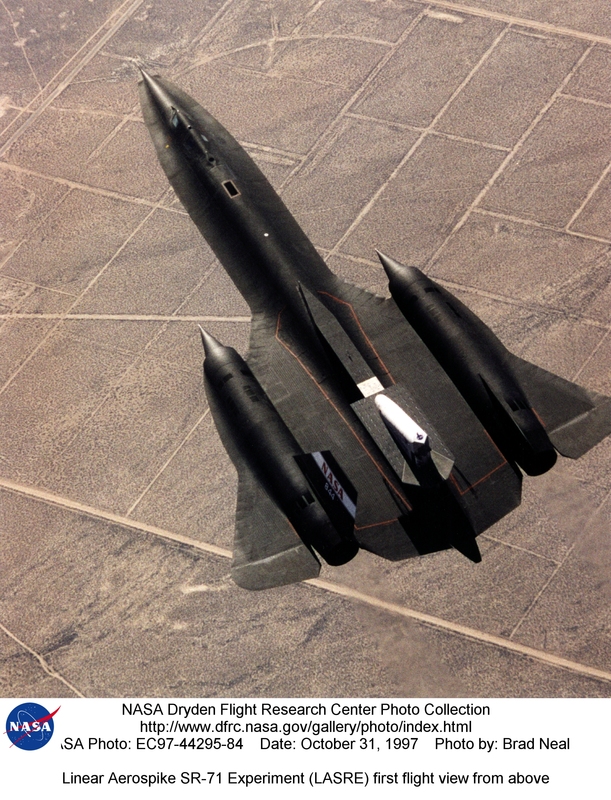 The joint NASA, Rocketdyne (now part of Boeing), and Lockheed Martin Linear Aerospike SR-71 Experiment (LASRE) completed seven initial research flights at Dryden Flight Research Center. Two initial flights were used to determine the aerodynamic characteristics of the LASRE apparatus (pod) on the back of the SR-71. Five later flights focused on the experiment itself. Two were used to cycle gaseous helium and liquid nitrogen through the experiment to check its plumbing system for leaks and to test engine operational characteristics. During the other three flights, liquid oxygen was cycled through the engine. Two engine hot-firings were also completed on the ground. A final hot-fire test flight was canceled because of liquid oxygen leaks in the test apparatus. The LASRE experiment itself was a 20-percent-scale, half-span model of a lifting body shape (X-33) without the fins. It was rotated 90 degrees and equipped with eight thrust cells of an aerospike engine and was mounted on a housing known as the "canoe," which contained the gaseous hydrogen, helium, and instrumentation gear. The model, engine, and canoe together were called a "pod." The experiment focused on determining how a reusable launch vehicle’s engine plume would affect the aerodynamics of its lifting-body shape at specific altitudes and speeds. The interaction of the aerodynamic flow with the engine plume could create drag; design refinements looked at minimizing this interaction. The entire pod was 41 feet in length and weighed 14,300 pounds. The experimental pod was mounted on one of NASA’s SR-71s, which were at that time on loan to NASA from the U.S. Air Force. Lockheed Martin may use the information gained from the LASRE and X-33 Advanced Technology Demonstrator Projects to develop a potential future reusable launch vehicle. NASA and Lockheed Martin were partners in the X-33 program through a cooperative agreement. The goal of that program was to enable significant reductions in the cost of access to space and to promote creation and delivery of new space services and activities to improve the United States’s economic competitiveness. In March 2001, however, NASA cancelled the X-33 program. Keywords: Dryden Flight Research Center; Lockheed Martin; X-33; SR-71; aerospike; LASRE; linear aerospike rocket engine; Linear Aerospike SR-71 Experiment.